A pleasing, folded mound of clay plate trimmings on the factory floor. The tides are turning in the way that brands, and in turn us as consumers, are waking up to what we buy for our homes. We want to know its provenance – where its materials came from, whose hands have moulded and crafted it and that we in a small way are part of supporting that process positively. A few weeks ago, I hopped on a flight to Lisbon with the MADE.com team to join them on a tour of two of their family-run ceramics factories. A stone’s throw from the city, the region has a deeply rooted history in ceramics, dating back to the founding of the monasteries. Generations of families work here, one specialising in decorative items (vases etc) and the other in tableware. Each with 30 to 40 years of production history, they were specifically chosen by MADE’s design team to produce their Noah dinner set and Cactus vase, amongst others. What they don’t know about clay and ceramics really isn’t worth knowing and what I expected to be a clinical process of machine and uniformity was quite the opposite. Each piece is made by hand and guided through various stages under the watchful eyes of skilled workers. The design process – working on moulds using soft plaster. At the beginning of the process, the factory work in tandem with MADE to design the first mock-up which is taken from technical drawings and moulded from soft plaster. At this stage, the mould can be altered as necessary. Once finalised, the ‘mother mould’ is created from which the entire collection will stem from. The beginnings of a set of bowls, making the mother mould. Organised chaos – stacks of catalogued moulds. Releasing a pot from its mould after an initial drying out sets the slip inside. Notice those huge vessels up in the rafters? This is where the liquid clay or ‘slip’ in poured from, using gravity to reduce the air bubbles as it makes its way down into pipes. The clay is locally sourced, chosen for its quality and durability. Anything from 10 to 120 moulds a day are filled with slip, sealed and left to dry for around 20 to 45 minutes before opening them up to dry out. The longer the slip stays in the mould, the thicker the wall of the vase or mug. Plates are made using a different process using solid clay blocks and a pressing machine, all overseen by hand. Up 500 are made each day and I’ve never seen anything so satisfying to watch! 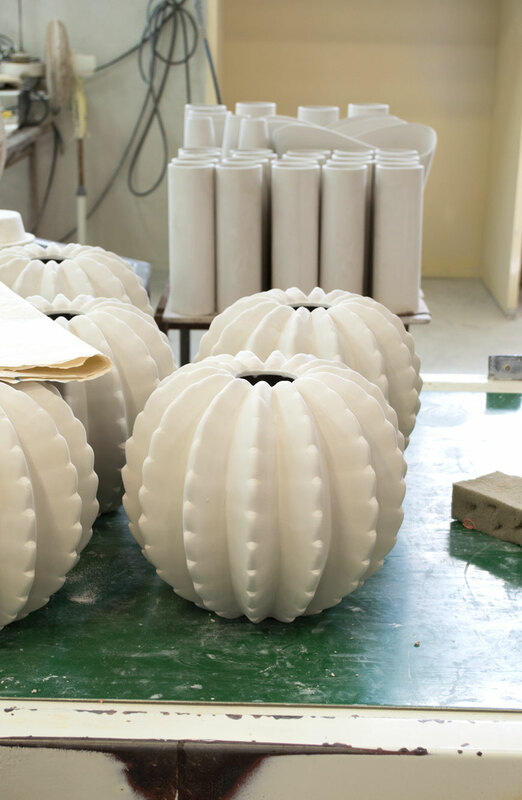 Fresh out of the mould – vases air dry before moving on to the next stage. After an initial dry out, any rough edges and imperfections are scraped away with a knife and smoothed with a wet sponge. A second drying out stage to ensure each piece is dry is needed before the first firing in the kiln. What I love so much about the handmade process is that each batch behaves differently depending on the clay mix, the time of year, what the weather happens to be doing. No day is exactly the same and it takes real expertise to understand how to navigate those variations. In winter the drying process is naturally much slower and batches are moved to closer to the kilns to dry, whilst in summer it’s much faster. MADE’s Abelone cactus vases sitting out to dry. Row upon row of beautiful bisque. My favourite part of the whole process – the bisque stage, where the pots have had their first firing in the kiln at a scorching 1,090 degrees. There’s something incredibly satisfying, looking at rows of carefully stacked, alabaster white bisque. Before moving onto the glazing stage, every pot is tapped with a stick to listen for any cracks which dull the sound. A library of pigments used in the lab to create glazes. In the past 40 years, both factories have seen trends move from the highly decorative, traditional Portuguese style to the more sculptural shapes and simple block colours we want in our homes today. With the crash of the ceramics industry in the 90s, unable to keep up with mass production from China, they had to modernise to survive. Combining their traditional techniques with contemporary styles and new glazing technologies, they now offer a very bespoke and personal relationship with brands like MADE. We need to attempt to produce ceramics with the techiniques, knowledge and skills from the past, with what the market demands nowadays. Nunu, factory owner and son of the founder. Demand is in the use of textured finishes and unique pigments which are mixed by technicians in the lab or ‘kitchen’. MADE will visit once or twice a year to plan new season colour palettes and ideas for unique finishes, with each client having their own exclusive range to avoid crossovers. Peder vases await quality control checks before packing and shipping. Pieces are then either sprayed or dipped in glaze, fired in the kiln for 9 to 10 hours then checked and packed ready to be shipped. It’s highly likely if you own a MADE vase that it’ll have been held under the watchful eye of just one woman with 20 years quality control experience. How’s that for a personal touch? Tonally pleasing buckets of glaze left over from dipping. The Noah plate, glazed, fired and ready to be checked and shipped to your table.